1 of 3 Heat oven to 350 degrees F. In a large bowl, beat together butter, sugar, egg and salt until fluffy, 3 minutes. On low speed, beat in flour until smooth. Tint dough pale green with food coloring. 2 of 3 Spoon dough into a cookie press fitted with a standard wreath disc, following manufacturer's directions. 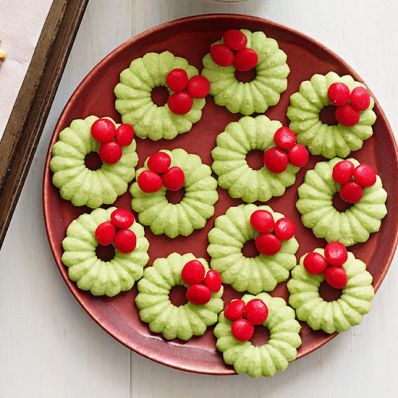 Press out wreaths onto large baking sheets, spacing cookies about 3/4 inch apart. Before baking, press in candy "berries" or confetti. 3 of 3 Bake cookies at 350 degrees F for 8 to 10 minutes or until slightly puffed and set. Transfer cookies directly to wire racks to cool.